Why journalists should never ask Donald Trump multipart questions. Why journalists should stop asking President Trump multipart questions. German Chancellor Angela Merkel and President Donald Trump hold a joint news conference at the White House in Washington on Friday. 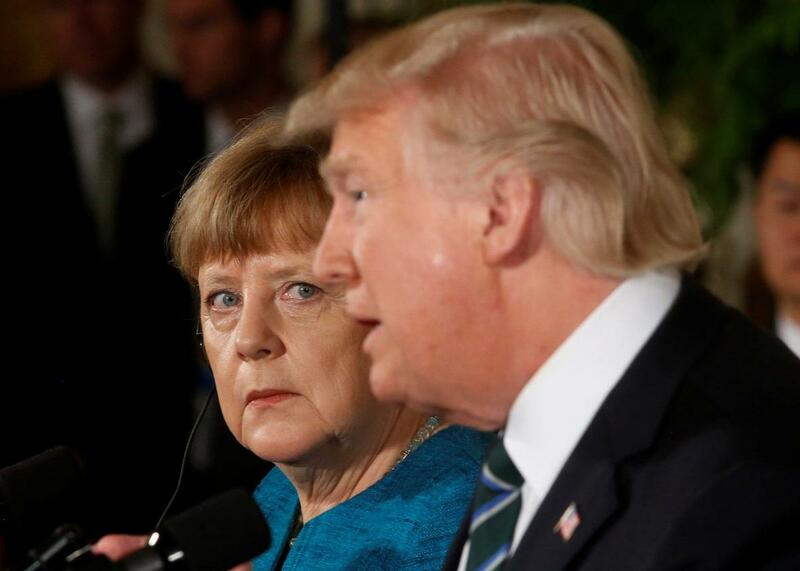 In a press conference with President Donald Trump and German Chancellor Angela Merkel on Friday, a German reporter asked Trump a question so brutally direct that it went viral on social media. The question has been loosely translated from German as, “Why do you keep saying things you know are not true?” (A slightly better translation might be: “Why do you assert things that cannot be substantiated?”) The reporter, Kristina Dunz of the German Press Agency, offered as an example Trump’s discredited claim that President Barack Obama had wiretapped him during the 2016 campaign. Dunz won praise from her stateside counterparts for the question’s bluntness. “Good for German reporters, asking Trump tough and direct questions on wiretapping,” Philip Rucker, the Washington Post’s White House bureau chief, told the Independent after the press conference. And that is how a seemingly hard-nosed question about Trump’s dishonesty elicited a self-serving pile of presidential mumbo-jumbo about isolationism, free trade, and “fair trade,” which does not mean what he thinks it means. It’s just the latest example of how this journalistic bad habit is undermining the media’s efforts to hold the Trump administration to account. The incentives that drive such questions seem relatively straightforward. Reporters typically have a lot they’d like to ask politicians, but their opportunities to do so are tightly constrained. Multipart questions are an attempt to cheat these constraints by rattling off a series of questions—or in Davis’ case, a whole interview’s worth—before anyone else can interject. On rare occasions, an indulgent or undisciplined subject will dignify each part with a response, and in those cases the only people who lose out are the other reporters who have less time to get their own questions in. Far more often, however, multipart question–askers are cheating themselves—and their audiences. The more questions they cram in, the more leeway they give politicians to home in on the ones most useful to their own ends—and wriggle clear of the rest. Multipart questions are bad enough when the subject is an ordinary politician. When it’s a demagogue who has built his political career on lies—the birther lie, the border-wall lie, the inauguration-crowd lie, the “fake news” lie—reporters’ failure to ask a single, direct question at a time is indefensible. It’s worth acknowledging that multipart questions aren’t always counterproductive. Perhaps the most famous two-parter in U.S. political history came from the Republican Sen. Howard Baker, who asked during the Watergate hearings: “What did the president know, and when did he know it?” That formulation resonated, of course, because of its simplicity rather than its complexity. Its second clause was not a digression from the first, but a direct follow-up that pressed for specificity. Besides, as Baker’s use of the third person implies, it was a rhetorical question—not one he asked of President Richard Nixon himself. If he had, Tricky Dicky no doubt would have found a way to sidestep it. By the same token, even a single-part question can go awry if it’s accompanied by a too-lengthy preamble. A reporter for an Orthodox Jewish outlet, Jake Turx, reportedly spent an hour crafting the perfect question to ask Trump at his Feb. 16 press conference, only to be cut off by the president halfway through his recitation of it. Misconstruing the reporter’s introductory comments, Trump yelled at him to “sit down,” adding, “I understand the rest of your question,” and calling it “repulsive.” In question-asking, as in writing, brevity pays dividends. So why, if everyone knows complicated questions are invitations to evasion, do journalists keep asking them? In some cases, as with Zeleny or Turx, it may be a case of trying too hard to strike just the right framing. Both of their questions would have worked fine in an email interview. Asking them live, however, allowed their subjects to seize the ball halfway through and run the other way with it. But Dunz’s question—and the praise she received for it—suggests another possible motive at work. Televised press conferences offer journalists a rare opportunity to play a role in the live theater of politics, rather than simply reporting on it. Viewed in this light, multipart questions are a bid to stretch out journalists’ time on the stage—and, perhaps, to win some applause of their own. No wonder it was Dunz’s question, and not Trump’s response, that went viral: It wasn’t really a question in the first place. It was her chance to publicly call Trump a liar. No doubt that was gratifying for Dunz and the Trump critics in her audience, not to mention the American journalists who have been reticent to criticize their president so openly. But it shined no new light on Trump, yielded no surprising admission or damning evasion. The naked mendacity of the Trump administration has already forced the political press to reconsider some of its laziest impulses: access journalism, false balance, credulous reporting of dubious claims. The grandstanding, multipart question should be the next to go. Ask one question. Keep it short. And if you don’t get a straight answer, ask it again.